I'm subscribing to google news about "Art Of ApOgEE" to know what is happening over the net about the art of apogee keyword. And today, I notice a link to my ApOgEE MyBlogLog home page on the news line. As I get curious, I click on the link and BOOM!! the New MyBloglog layout for my home page. 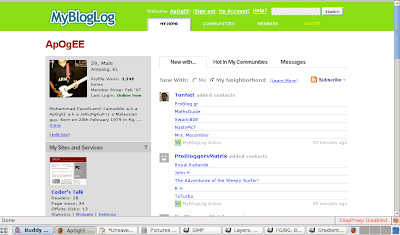 Seems, like MyBloglog have done a big layout modification and there is new widget for my blogs too. I've been one of MyBloglog loyal fan since I start blogging... feel free to add me as your friends, and join my Art Of ApOgEE Community. Come on, It's free! !